on this stump. There’s a rabbit! I bet he won’t jump. Jazz Haiku by James Emanuel, cartoon illustration by Old Pond Comics. Kobayashi Issa, translated by David G. Lanoue. Today, the 12th day of the tenth month, is the death anniversay of the “Old Man”, aka Basho. According to David G. Lanoue, this anniversary is also called “Winter Rain Anniversary” (shigure ki) and “Bashô’s Anniversary” (bashôki). In my cartoon, I imagine that the sparrows are actually paying an hommage to Basho by reciting his poem “Matsushima, ah!” on his anniversary. PS I meant to post this on Basho`s Death Day — which was October 12 I believe — but it looks like it was published a day too early. This zine by Old Pond Comics features forty haiku-comics inspired by poems of famous Japanese poets Basho, Issa, Buson and more! Inside the booklet, the haiku-comics are separated by seasons. The center-fold is a series of 4 haiku-comics on Kobayashi Issa’s snail haiku (my favorites). It’s important to put good comics in the centre because that’s where the book naturally opens when people browse. Some winter haiku-comics featuring haiku by Kobayashi Issa and Buson. The cover features a print from Hokusai’s “Thirty-Six Views of Mount Fuji”. The back cover features a little portrait of Kobayashi Issa (the main source of inspiration for my haiku-comics). The zine will be for sale at Canzine this Nov.8 and on the Old Pond Comics online store . This week, I went moon-viewing (Otsukimi) for the first time in my life. I am putting together a zine detailing my experience. I’m hoping to post it within the next week. Stay tune! Haiku by Basho illustrated by Old Pond Comics. A haiku is what a happens at a certain place at a certain time, said Basho. 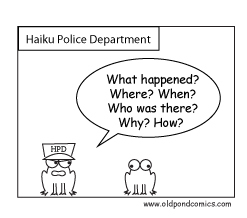 The Haiku Police Department agrees (Old Pond Comics).